Casumo Casino was founded in 2012 and has made it their ultimate mission to offer its users fun and good fortune. The casino headquarters are based in Malta and has additional offices in Barcelona and Gibraltar. Casumo casinos mission is creating a gaming experience that has never been done before by blending the casino experience and thrills into the addictive realms of virtual gaming. This has helped Casumo casino develop a competitive gaming system across the globe. With an appealing, modern and playful website the casino is user-friendly with features that can be accessed easily. It provides a platform for online games for to its customers which loads quickly and has high-quality. The casino site is designed brilliantly and will keep players coming back time and time again. There are 15 progressive jackpot titles featured on Casumo casino known to hit the million mark as they continually increase with no maximum limit. If you are looking to change your life, you can do so in a single spin as there are many jackpots known to smash the multiple million value. The largest jackpot that Casumo casino featured was Hall of Gods with over£4 million. You will find over 380 different online slots in the casino catalog waiting to be played. One can play free slots like Pick and Mix, Rainbow Riches, Reels of Gold. With something to offer for everyone, there are also a number of slot jackpot games available, they include, Mega Fortune and Mega Moolah. These 2 are well known for their massive payouts. New slots games are constantly added and the recent releases include the Guns N Roses and the Jurassic World. A lot of time and caution has been used to choose from the best online table games available. The section featuring the roulette games contains varieties such as American Live and French Roulette and Monopoly Roulette Tycoon which offer interesting experiences. The blackjack section with its diverse stake gaming options stands out with both high and low stakes gaming options. This includes Double Exposure and Pontoon Blackjack.A wide variety of other favorites poker games and baccarat are also available making the Casino stand out. Casumo live dealers offer a live gaming section from which one can select from two of the industry’s stalwarts in producing high quality live gaming experiences. The top live game software providers are Net Ent and Evolution Gaming. With a wide selection of roulette tables from the provider. Games that have a live dealer include Roulette, Blackjack, Ultimate Texas Hold’em, 3 Card Poker and Baccarat. no deposit are not available). Here are the bonuses offered by the casino. As a new player at the casino, a new-player bonus is offered. 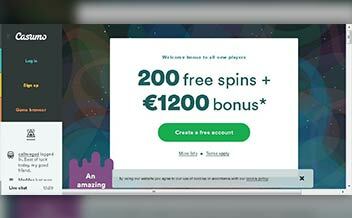 When you sign up, you are given 20 free spins right away that can be used in a specified slot. The best thing with all this is that No deposit is needed to benefit from this offer. In addition, when the first deposit is made by a player it receives a 100% match up bonus to a maximum of £300. The required minimum deposit amount for the bonus is £10. A huge casino welcome bonus of £1200 and 200 free spins is offered and awarded over 5 deposits. The first bonus is 200% up to £50 and 200 free spins. There are 20 spins per day for the first 10 days after you create an account. The second bonus is 50% up to £150.The third bonus is 50% up to £200.The fourth bonus is 25% up to £400. The fifth bonus is 25% up to £400.All this adds to £1200 and 200 free spins up for grabs. These bonuses are subject to x25 wagering requirements. Casumo Reel Races are slots tournaments which help one rack up points against other players, it takes place every 30 minutes 24/7. The reel races allow players to spin and win points which will all be added up at the end, with prizes being given out to winners. £1000 is given out every single evening. Casumo casino is always updating its site with new games, tournaments, and promotions. It’s very important to have the latest information regarding games and promotions to take advantage of the amazing offers and make money out of it. Due to this reason, this section is dedicated to providing the latest information crucial to all Casumo players. 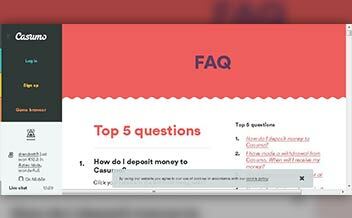 Keep visiting the section to ensure that you have up to date information about the casino. Casumo features one of the web’s widest selection of games provided by some of the biggest gaming software providers out there today. These include games from Net Ent, Micro gaming, and IGT among others. All of the above software providers are renowned for high-quality content and have received many industry awards. Having this collection is advantageous for the operator. The casino is compatible with most devices and recently won the Best Mobile Casino of the Year award at the annual EGR Operator Awards. Players can deposit and withdraw money through MasterCard, NETeller, Paysafecard, Skrill, PayPal, Visa and bank transfer. With these options available, a player, is free to choose which payment method fits them best. Download, Instant Play, and Mobile App. Languages supported by the casino are English, Swedish, Norwegian, Finnish, and German. Casumo Casino is available for both pc and mobile devices. 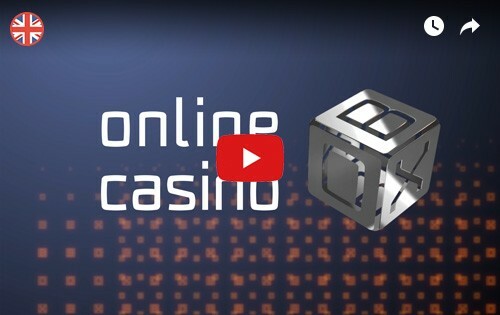 On top of this, players can login the casino through a web browser. The web version of the casino provides users with all the games that Casumo casino has to offer. The casino supports all major web browsers, i.e. Safari, Chrome, Firefox, Opera and many others. The casino provides desktop versions for Mac OS, Windows and Android operating systems. There are also Android, Blackberry and iPhone versions for mobile devices. The visual aesthetics of the website are very playful. There has clearly been a lot of time spent on creating fun cartoonish graphics which follow the brand values set out by the company. 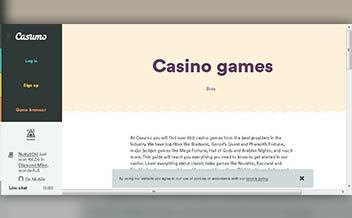 Casumo has opted for a simplified web page design with the front page and the game browser acting as the two central points of navigation with all the information you need just a scroll away. 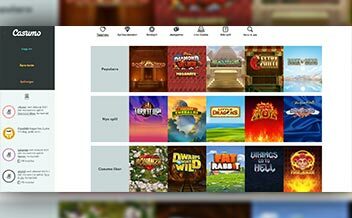 The game browser appropriately breaks down the games into the most popular, slots, table games, jackpots, live games and finally all the titles. When you decide what you want to play, it takes just one click to launch with typical load speeds lasting under 35 seconds. There is no download option as all of the games are available through instant play. The desktop site allows easy navigation to your favorite games and pages as it is clutter free. The newsfeed on the welcome page updates users with the recent activities, such as players and their winnings, trophy achievements and free spins awarded. The software requires regular updates to work properly. The software requires a lot of data. Available for both Android and iOS devices. Allows users to play games and follow their progress on the go. Does not have as many games as desktop and web versions of the casino. Although the interface is great, it is limited by the small display size of mobile devices. Casumo is a safe and fair casino. They are licensed and regulated by the UK Gambling Commission and the Malta Gaming Authority. As such, they adhere to strict standards relating to player protection and fraud prevention. The casino website is protected by high-end technical security, including encrypted transactions to safeguard any sensitive and personal data. Reliable customer support is something that players demand from an online casino, and Casumo offers various options to customers in need of help. For starters, there is a detailed FAQ section on their website. It is broken down into various topics, such as bonuses, payments and account queries. You can often find the answer to your inquiry quickly using this tool. You can contact the casino by email. The quickest and easiest way to contact the support team is through live chat, which is available 24 hours a day. In an unusual move, the operator does not offer telephone support.